The second of our productions from Cohn White’s excellent 8mm film collection. Much of the action whisks us back to the last valiant days of the B.R. 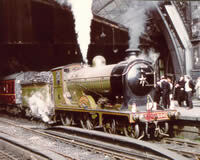 steam engine, and locomotives of all regions feature. Originated on 8mm cine and transferred to low-band Umatic, fully sound-tracked, this full colour film will delight and captivate all steam enthusiasts. 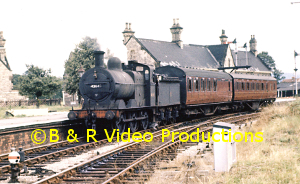 Section 1:- (14 mins) – Steam operations centred around Weymouth, Upwey Wishing Well Halt and Radipole in 1966. This heavily graded section of the old GWR/LSWR Jnt. 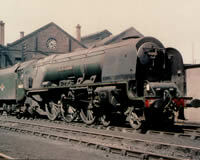 Railway from Dorchester severely tested the Bulleids, Standards, and ex-LMS locomotives on this line at the time. Section 2:- (8 mins) – Shap – The last Autumn, the mass drafting of virtually the entire Britannia fleet to Kingmoor gave rise to new possibilities to capture this elegant class roaring up and down the North West main line. Nine of the class feature. Section 3:- (12 mins) – LNER engines were rarely filmed, we’ve a few in the shape of a couple of Named B1s, a J37 & J38 (and a non LNER WD!) 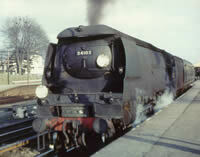 preceding 60024 in 1966. 60009 brings us into preserved times as we study some of the less known locos; 65033, 61572, 65462, 69023 (on the Derwent Valley line), and we follow 69621 on her trip from Leeds to the Stour Valley Railway. Section 4:- (9 mins) – Flying Scotsman is undoubtably the most famous LNER engine, this Historical sequence reveals her activities in 1968; preparations at Finsbury Park; departure from Kings Cross 1st May on the 40th anniversary of her non-stop run to Edinburgh; other shots near Hitchin, Hadley Wood, Brookmans Park and Hornsey. 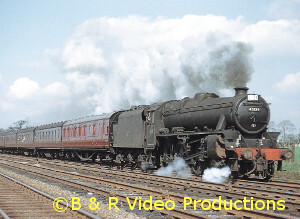 Section 5:- (9 mins) – Ex GWR 0-6-0 Panniers were sold to London Transport, to work out of Neasden. We follow the escapades of a number of these popular tanks on the Croxley Green Rubbish Tip run! Section 6:- (8 mins) – This final section portrays the Victorian elegance of the Stirling Single, GNR No.1 during her brief sojourn on the Main Line Steam Trust at Loughborough in 1981.